A new study co-led by University of Iowa researchers explains how ammonia is distributed in Earth's upper atmosphere. The study authors used computer modeling to determine that ammonia is eventually released as a gas into the upper atmosphere. The modeling explains a mystery–data gathered by satellites that shows plumes of ammonia in the upper atmosphere, especially over parts of Asia during the summer monsoon season. The research is important because it answers on a molecular scale how ammonia is absorbed by liquid water droplets and later is pushed into air during convection, when air rises from Earth's surface, and freezes in the upper atmosphere. "We found we can simulate and predict where ammonia should be, and our predictions align with satellite measurements," says Jun Wang, professor in chemical biochemical engineering in the UI's College of Engineering and whose team led the study. "The novelty of the research is to combine what we know at the molecular level and put that into a global-scale simulation model." Ammonia (chemical formula NH3) has been measured near Earth's surface, but gauging its concentration in the upper atmosphere–more than six miles up–has been challenging. In 2016, satellite measurements detected ammonia plumes in the upper atmosphere over subtropical regions of Southeast Asia. That surprised researchers because it's widely believed that all ammonia should be absorbed by cloud water or acid aerosols in the lower atmosphere, up to three to four miles above the surface. "So the question is, 'How does ammonia rise to such an elevation (nine miles) above the Earth's surface when it reacts so well with other species?'" Wang says. "How does it remain as a gas in the upper atmosphere?" Using computer modeling, the UI team, with help from researchers at the University of Nebraska-Lincoln, found that ammonia molecules occupy a thin layer between ice particles and the outside air, and are released when the ice particles collide in the upper atmosphere. "We show that the NH3 dissolved in liquid cloud droplets is released into the upper atmosphere upon freezing and that there is a subsequent collision of ice particles during deep convection, thereby explaining the unexpectedly high concentrations of NH3 in many parts of the world," the authors write. The paper, published online May 30 in the journal Proceedings of the National Academy of Sciences, is titled, "Molecular perspective for global modeling of upper atmospheric NH3 from freezing clouds." Co-corresponding authors include Joseph Francisco and Xiao Cheng Zeng, from Nebraska-Lincoln. The first author is Cui Ge, assistant research engineer with Wang's research team. 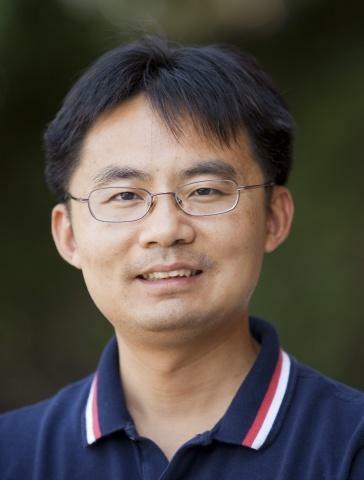 Chongqin Zhu, also from Nebraska-Lincoln, is a contributing author. NASA supported the research through grants to Wang. The U.S. National Science Foundation also supported the work through grants to Francisco and Zheng.